I love sewing pants! They are by far my favorite projects to work on. These Capri’s are a pattern hack of By Hand London’s Holly Pants and Connie Crawford B5504 (two of my fav pant patterns!) 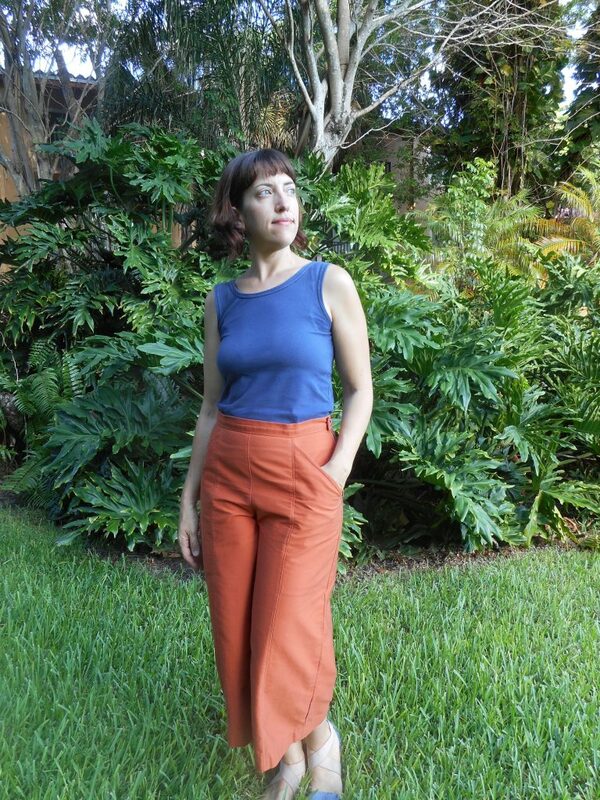 in an awesome Rust Organic Cotton Twill from Mood. I tend to prefer very simple/clean lines in solids when I make pants so they never look as exciting as a patterned dress but the sewing is really satisfying. 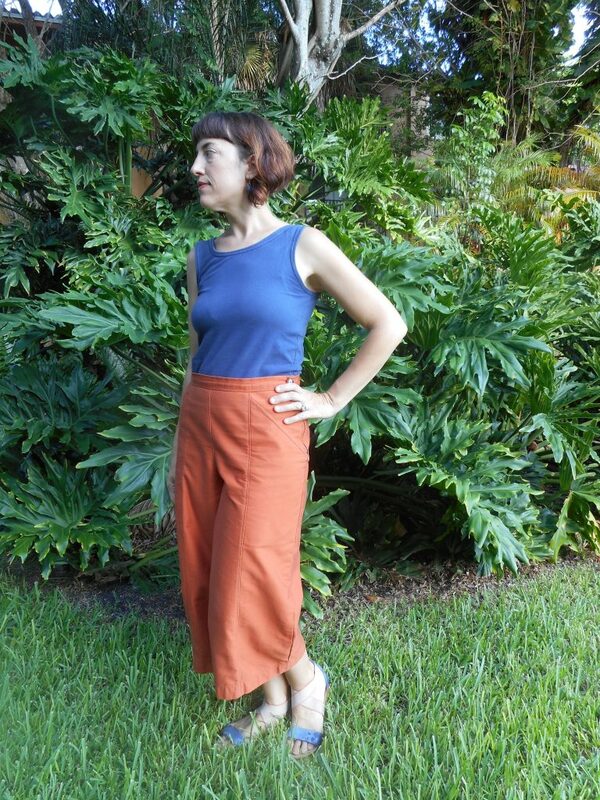 For these rust colored Capri’s I combined the seaming, pockets and length of Connie Crawford’s B5504 Butterick Pattern and the waist shaping, darts, side zipper and waistband of By Hand London’s Holly. 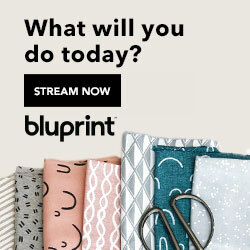 You can see my striped B5504 Capri’s here and my white Holly Linen Pants here. 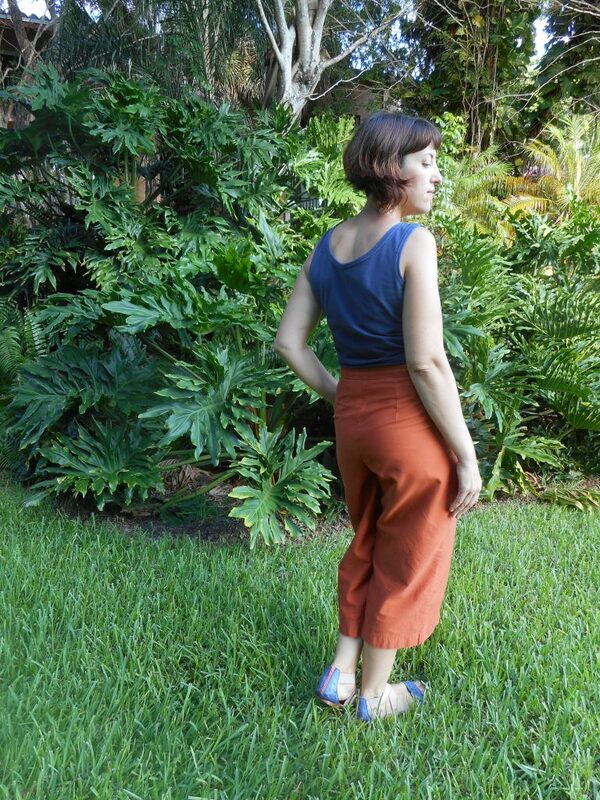 I’m wearing them with an organic cotton knit self drafted tank top here. I combined these two patterns on by super imposing them on tracing paper and adding new seam allowances, altering the waist most. I had already adjusted the waist and crotch of the Holly pants using my sloper. They close with a straight cut enclosed waistband with a regular zipper and button closure. Organic Cotton Twill in Rust– Mood Fabrics this color is sold out but check out these similar twills-so many colors! This thread is a perfect match in Organic Cotton in Terra Cotta from Organic Cottons Plus. Recycled Zipper and Button from stash. *Please note this post contains an affiliate link below. If you purchase a class after clicking through the link provided I receive a small commission. Thanks! These pants are so comfortable and I really have the fit down now. I love the pockets and the trim waist and the length is really easy to wear. The color is what makes these really pop. 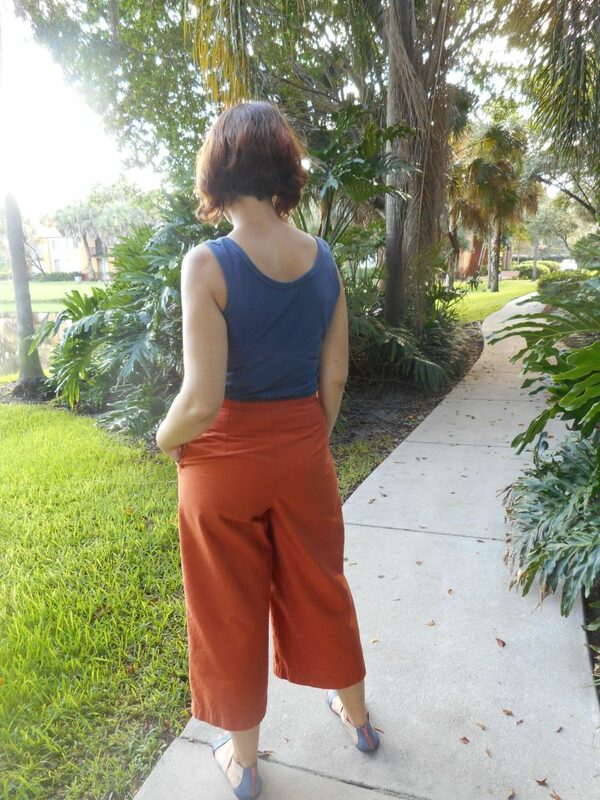 They’re a beautiful rust colored twill with a subtle weave from Mood. I purchased this Organic twill to try out a few months ago and I just love it. The weight is sturdy but not too heavy. It looks much more substantial than it is. The color is lovely! Plus it really goes with everything in my wardrobe. I really needed some more neutral basics and this fits the bill. My color palette in my handmade wardrobe is mainly coral, rust, indigo and white so everything looks great together. Yesterday was the kids first day of school together and I wore this for the walk. Ami started kinder and Nigel is in 2nd grade. I’ve been a Stay at Home mom for almost 8 years now so it feels so weird to have the day to myself. It’s going to take some getting use to-especially the quiet! Back next week with two dresses I made using a beautiful landscape panel print from Marcy Tilton! 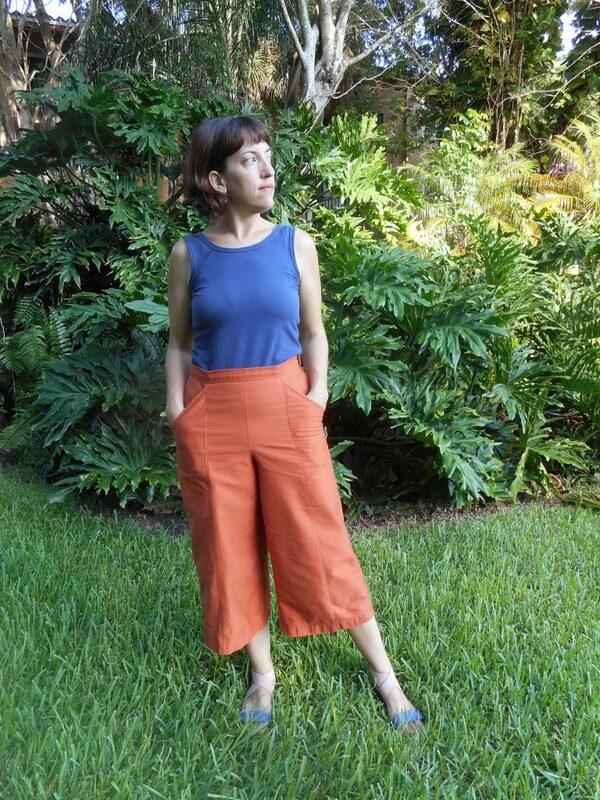 these are lovely, I started on a pair of culottes but the linen was too heavy and I dont know yet if its the fabric or that the culottes are based on a skirt block ….have been meaning to recut them all summer to a pair of gauchos – seeing your lovely make has reminded me to put it back on the to-do list…. love that seam down the front leg – gorgeous fabric too! 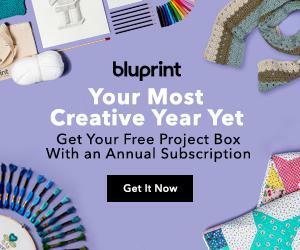 These are perfect for summer into fall! I need to visit you because I think sewing pants are absolutely devilish! You seem to have it down! 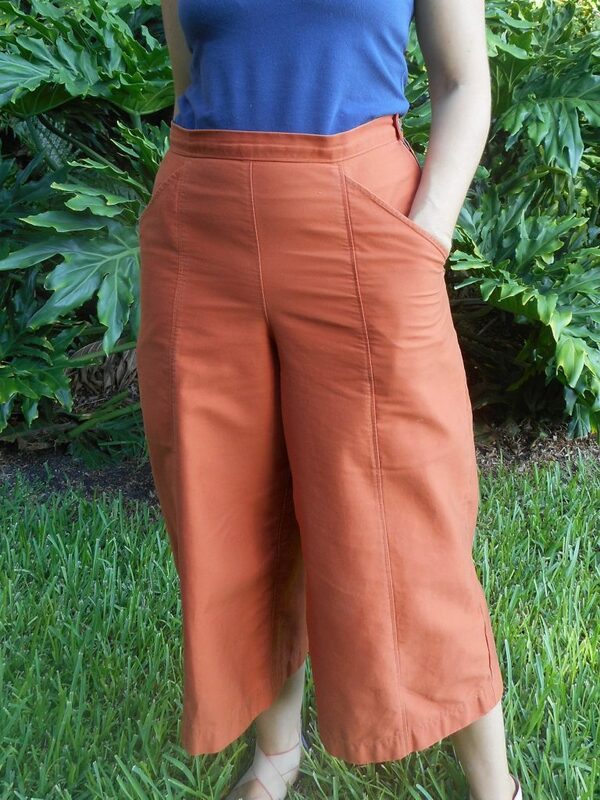 What a beautiful pair of trousers, the colour makes them come to life and the fit is spot on. Love the pockets and the front seams! Thanks so much! The color really is my favorite part of these pants!